These are instructions for the optional part of the Understanding the AM API using a Content Centric Networking application tutorial. Make sure you have completed the instructions at Run the CCN application before you continue. Figure 5-1 Click on the GENI Desktop button in the Slice Tools section of your Slice page. Before the GENI Desktop launches, it will ask for authorization. Follow the instructions to click on the button. Figure 5-2 Click on the Authorize the GENI Desktop button. It will ask for you to choose your member authority. Figure 5-3 Click on your member authority. On the next screen, choose the Add Global Node button. Figure 5-4 Click on Add Global Node. The next screen will welcome you to the GENI Desktop. Wait until the tool is ready. This may take several minutes to complete. It should look like the image on the right when it is done. Figure 5-5 GENI Desktop Welcome. We are now ready to graph traffic on the four links of the topology. Click on the Passive Graphs Lite in the menu that pops up. On the GEMINI Graphs menu that pops up, deselect all boxes and select linkoctets. We will be graphing the number of bytes (a.k.a octets) on the links. You can close the GEMINI Graphs menu. At this point you will see four graphs showing traffic on each of the four links on your experiment. The traffic you see on the links is broadcast traffic from the switch on the rack to which these nodes connect. It is not related to your experiment. Go back to the ssh window you used to log into the researcher node (a.k.a. user) when you did the CCN exercise. Use the /opt/ccnx-atmos/client.py program to fetch precipitation data for a time period you had not previously fetched. This is to make sure the data will be fetched from the data source (data) and not from the cache at some node. The time period must be between 1 Jan 1902 and 31 Jan 1902. 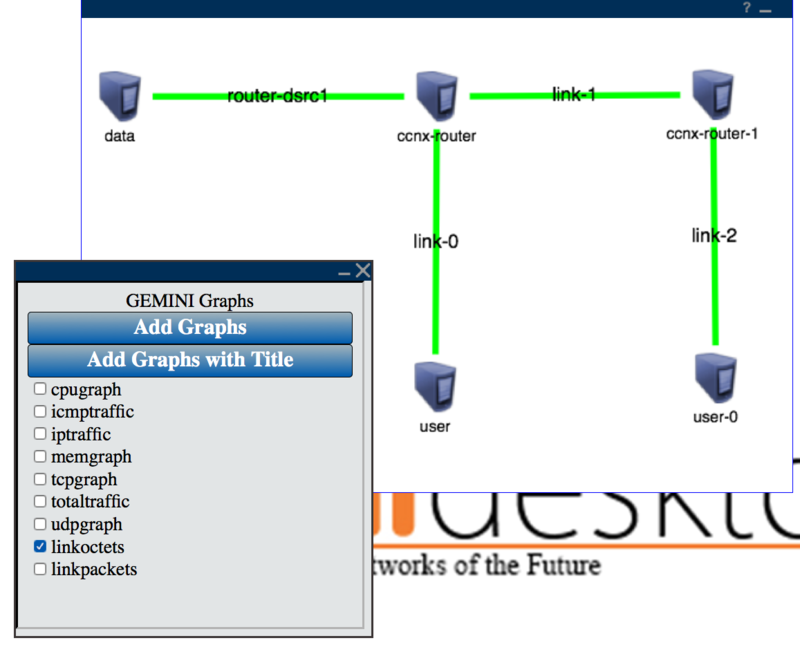 Your graphs should now show traffic on the router-dsrc1 and link0 links (see example below). The graph on the left is the network being quiet, while the graph on the right shows traffic flowing. This is because the precipitation data was not cached anywhere and had to be fetched from the data source. Please take note that the graphs are not scaled for direct comparison and take careful note of whether the max Y values are in bytes or kilobytes. Fetch the same data again. Notice there is no experiment traffic on the links. This is because the data was fetched from the cache on the node user. Log into the collaborator node (user-1) to fetch data that was previously fetched by the researcher node (user). Can you tell from where the data is fetched based on the graphs? From the collaborator node fetch data that was not previously fetched by the researcher. Where did the data come from this time? Go back to the CCN exercise to free up the resources you used in this experiment. GENIDesktopButtonCropped.png​ (142.6 KB) - added by Vic Thomas 5 years ago. desktop-selectProject.png​ (103.6 KB) - added by Vic Thomas 5 years ago. desktop-otherSlices.png​ (145.6 KB) - added by Vic Thomas 5 years ago. desktop-dispCheckedSlicesCropped.png​ (156.7 KB) - added by Vic Thomas 5 years ago. pull-researcherCropped.png​ (646.7 KB) - added by Vic Thomas 5 years ago. desktop-mainCropped.png​ (420.8 KB) - added by Vic Thomas 5 years ago. desktop-launcherCropped.png​ (518.2 KB) - added by Vic Thomas 5 years ago. desktop-addGraphsCropped.png​ (607.5 KB) - added by Vic Thomas 5 years ago. desktop-allGraphsCropped.png​ (846.5 KB) - added by Vic Thomas 5 years ago.